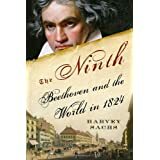 The Ninth: Beethoven and the World in 1824 ReviewHarvey Sachs has lived his life in music, including a stint as a conductor; he has authored a handful of other books on musical matters or musicians (notably Arturo Toscanini and Arthur Rubinstein) and he currently is on the faculty at Curtis. The genesis of this book seems to have been twofold. The first was when a friend suggested to Sachs that he write a book on one particular year in the history of classical music, centered around the key musical events of that year. Rather than choosing one of several years marked by the debuts of multiple landmark pieces (1912, or 1876, or 1830), Sachs, in taking up the suggestion, chose the year 1824. Why? It was the year Beethoven's Ninth Symphony was first performed, and - here's the second source - it has been Beethoven's music that has meant the most to Sachs throughout his life. Thus, he writes, "this book is a vastly oversized and yet entirely inadequate thank-you note to Beethoven." Much of the book, of course, deals with Beethoven's Ninth - which Sachs calls "one of [words of understatement?] the most precedent-shattering and influential compositions in the history of music." The first chapter contains an extended account of the very first performance of the Symphony - on May 7, 1824. Most of the third chapter consists of Sachs' description of the Symphony, as it unfolds or, perhaps more aptly, as it "befalls us". Sachs acknowledges upfront that he is attempting to describe the indescribable, though he comes closer than I would have expected. In the fourth chapter, he discusses the influence the Ninth had on other composers of the 19th Century, from Schubert (who attended that May 1824 premiere) to Wagner. In discussing the Ninth, Sachs stays away from technical musical analysis and jargon. You do not have to have been trained in music theory to understand and appreciate what he says. On the other hand, you do need some familiarity with the Ninth as a listener (though those who don't have such familiarity probably aren't reading this review). In fact, you may well be inspired, as I was, to re-read Sachs's 30-page account of the Ninth while listening to the symphony on a CD. It was a rewarding and enriching experience for me, non-specialist that I am. But there are two other parts to the book that I found even more rewarding. One is a brief but very well-done biographical sketch of Beethoven (pages 36-57). The second has to do with the year 1824, the somewhat repressive political milieu then prevailing in Europe, and how this political atmosphere inspired (or provoked) artistic calls for freedom - political freedom, freedom of expression, and freedom of the mind and spirit. According to Sachs, Beethoven's Ninth was related to other milestones in the arts, involving figures like Stendhal, Byron, Pushkin, Heine, and Delacroix. "[T]hese artists were not apolitical; they internalized and sublimated revolution in an age of political repression and transformed it into what we call Romanticism." Want to learn more information about The Ninth: Beethoven and the World in 1824?